Dimensions 0.75 by 8 by 10.25 in. A fresh and original way to put the classic advice of Joy of Cooking to work -- illustrated and designed in a beautiful and easy-to-use new book. Sixty years after Irma Rombauer advised new cooks to "Stand facing the stove," America's love affair with Joy of Cooking continues unabated. And why not? Joy in hand, tens of millions of people -- from novices to professionals -- have learned to do everything from make a meat loaf to clean a squid to frost a wedding cake. For decades, Joy of Cooking has taught America how to cook, serving as the standard against which all other cookbooks are judged. All About Vegetarian Cooking upholds that standard. While keeping the conversational and instructional manner of the flagship book, All About Vegetarian Cooking is organized by ingredient and type of dish. 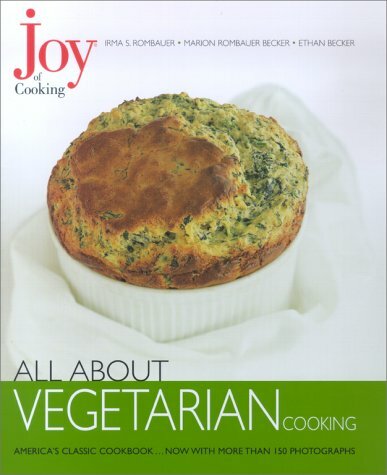 Chapters include stocks and soups, salads, vegetables, beans and tofu, pastas and grains, and eggs, and incorporate more than 100 of Joy's bestloved vegetarian recipes, from Roasted Vegetable Lasagne to Greek Spinach and Cheese Pie. You'll also find information on nutrition for vegetarians, planning menus, and rules for serving sizes, as well as tips and techniques for buying, storing, and preparing fresh vegetables. Add to that more than 150 original photographs, specially commissioned for this volume, presented in the most easy-to-use design imaginable. Whether you belong to one of the millions of American households that already own a copy (or two) of Joy, or you have never cracked the spine of a cookbook before, Joy of Cooking: All About Vegetarian Cooking is for you. It is a spectacular achievement, worthy of its name. Joy has never been more beautiful. About: Contains more than one hundred vegetarian recipes from the Joy of Cooking, including tips on buying, storing, and preparing vegetables.